The nickname says it all. In Sin City, drinking, gambling, partying and other forms of debauchery are omnipresent, so if that’s what you’re coming to town for, it doesn’t really matter where you stay or go. Still, Vegas has a plethora of places that do matter: restaurants, bars and other attractions that represent the very best the town has to offer. To experience the real Las Vegas — the Sin City locals hit when they go out for a night on the town — consider the following. For decades, Vegas casinos prided themselves on keeping guests indoors as much as humanly possible. Caesars Entertainment, which owns Paris Las Vegas, even painted the ceilings to resemble cloud-filled skies so gamblers would never feel the urge to go outside. In recent years, however, two of the major casino companies on the Strip have thrown this thinking to the curb — literally — and opened up al fresco attractions where visitors can breathe — gasp! — fresh air. Finally, swing by the Downtown Container Park, an open-air mall composed of 40 repurposed shipping containers. Be sure to slide down the three-story adult “treehouse” in the center of the park. The 40-foot-tall fire-breathing praying mantis out front is pretty neat, too; it was created originally for the Burning Man festival by aerospace engineer and artist Kirk Jellum. Since the days of Sinatra and Sammy Davis, Jr., Las Vegas has been known as a golf town. No. 1 on the lists of every golf nut is Shadow Creek, which is open to guests of MGM Resorts on weekdays (but closed to everyone but the biggest whales on weekends). The course is about 15 minutes off the Strip. Other notables are Cascata, the Jack Nicklaus-designed Coyote Springs and the Wolf Course at Las Vegas Paiute. Word of wisdom: The courses out at Lake Las Vegas, once touted as a golf mecca, are no great shakes. 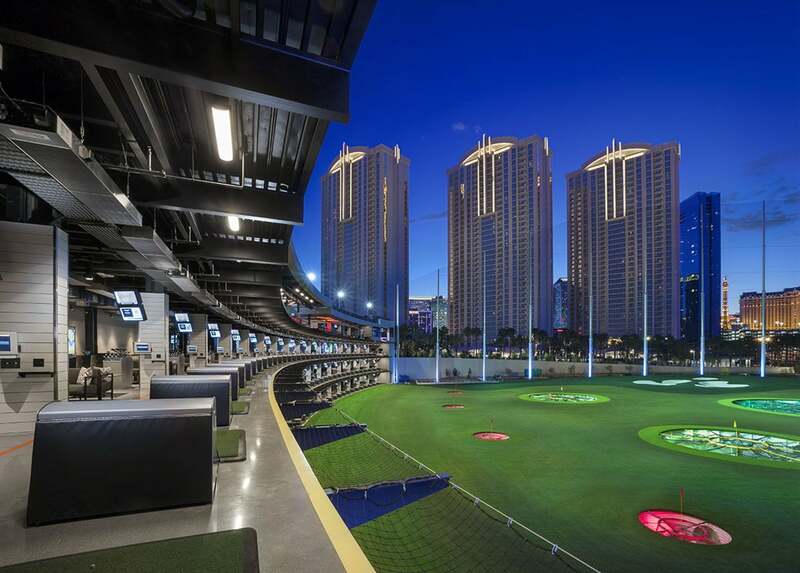 For those who’d rather just smash a few balls, check out Top Golf, located behind the MGM Grand. The glorified driving range has more than 100 bays spread across three levels — some bays are attached to sports-bar-like VIP lounges with couches, flat-screen televisions and more. There’s also a pool area on the top floor, in case you want to take a break from teeing off for a short dip, and a restaurant that cooks meals to order. Finally, of course, there’s 21 Greens, a virtual-reality golf simulation just south of Downtown in an area known as the 18b Arts District. What makes this facility unique is its layout — groups swing clubs in private golf suites complete with comfy couches and food and drink service. The hourly rate is the same for up to six guests. It should come as no surprise that Las Vegas has emerged as one of the cocktail capitals of the country: Drinking is as much a part of the Sin City experience as gambling and smoking. Some bars, however, are better than others — especially when it comes to the high end. No. 1 on any list: The Chandelier, inside the Cosmopolitan of Las Vegas. 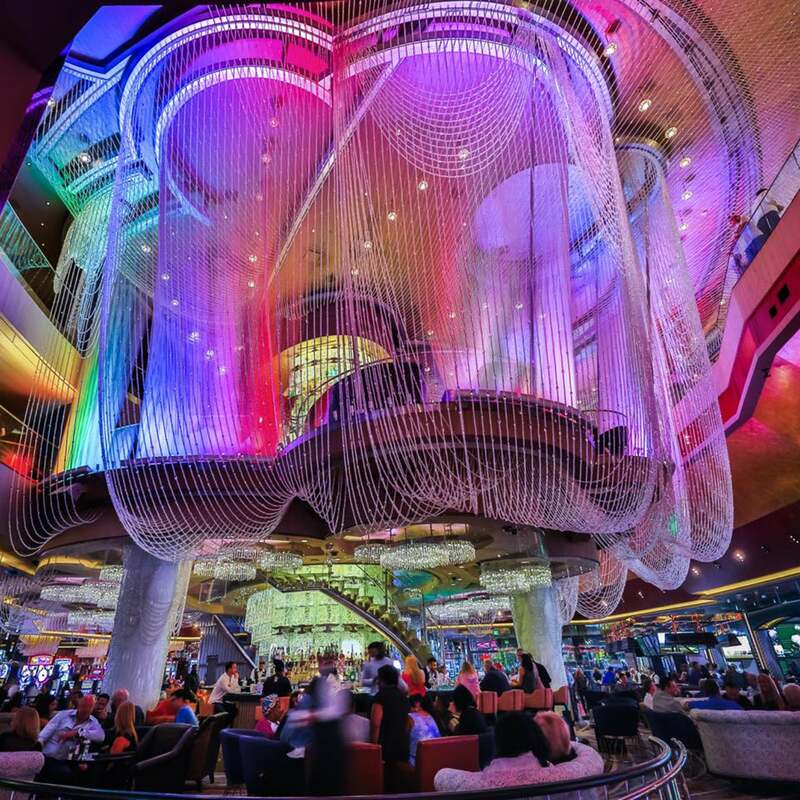 As the name suggests, this three-story lounge sits inside a giant chandelier, made with more than 2 million Swarovski crystals. Chief mixologist Mariena Mercer sets the drink menu for the bars on every level, but the real magic happens on Level 1.5. Here, Mercer stacks the menu with her specialty: edible cocktails. On the current iteration of the menu, this includes drinks with edible paper. It also always features the off-menu Verbena, a margarita with a special “buzz button” that hypes up your mouth before you go bottoms up. The Venetian/Palazzo complex also is mixology heaven, with three great spots to enjoy good drinks. The Dorsey, just off the main casino floor at the Venetian, serves modern twists on classic cocktails, with decorated mixologist Juyoung Kang incorporating her own mixers and syrups to the bunch. Rosina, just off the main casino in the Palazzo, prides itself on a secret julep menu, and boasts a champagne button that guests can push when they want more bubbly. The bar at Delmonico Steakhouse also is worth visiting; there’s a library with more than 700 different types of whiskey, bourbon and scotch, and the drink possibilities with this stash are practically limitless. Downtown, the best options for classic cocktails are Oak & Ivy, which is located in the Downtown Container Park and highlights brown liquors; and Herbs and Rye, an old-school bar that focuses on classic cocktails and mean martinis. It might sound like blasphemy, but some of the most exhilarating experiences in Las Vegas actually are off the Strip, in and around the mountains that ring the Las Vegas Valley. To the west, check out Red Rock National Conservation Area, a great spot for hiking, rock climbing and mountain biking. Inside the park is an informative visitor center and a 13-mile scenic driving loop. Outside the park, a local outfitter, Cowboy Trail Rides, also runs half- and full-day horseback riding trips, some of which include meals. Another option to the north and west is Spring Mountains National Recreation Area, home to the region’s tallest peak in Mount Charleston, which tops out at almost 12,000 feet. The latter spot is a great destination for summer days when the thermometer is well over 100; temperatures in the canyons can be 20 to 30 degrees cooler than they are on the Strip. Be sure to stop in at the circa-2015 visitor center on the way up Kyle Canyon Road. Elsewhere in the Valley, to the east, the paved River Mountains Loop Trail starts in Boulder City, follows the shore of Lake Mead and doubles back past Henderson before heading back — 32 miles in all. The trail is mostly flat and connects with a dirt spur that runs through old railroad tunnels to the Hoover Dam. Bike rentals are available just off the trail in Boulder City. Finally, for a day of water sports, head to the manmade Lake Las Vegas, an oasis that sits in a tiny valley farther east and slightly north of Henderson. You can rent kayaks and stand-up paddleboards in the tiny village of Montelago, which also boasts a handful of restaurants to refuel after you’re done. Since the days of the Rat Pack, Las Vegas has been known as an entertainment hot spot. Performers who visit Sin City certainly still can pack ‘em in. Without question, the biggest draws these days are the headliners: Lady Gaga, Bruno Mars, Celine Dion, Elton John, Jerry Seinfeld and more. Most of the biggest concerts are booked at the Colosseum at Caesars Palace and the Park Theater, a new venue attached to the Park MGM. Occasionally when bands with huge followings come to town, they’ll play at the T-Mobile Arena, or at the Thomas & Mack Center on the University of Nevada, Las Vegas, campus. Theater also is a huge part of the entertainment experience in Vegas. Currently, Sin City is home to seven different Cirque du Soleil shows — 90-minute escapades that feature a mix of acrobatics, dance and acting. Spiegelworld, a darker circus-like troupe, operates two shows in town with a third coming in March. Independent of these two companies, the newest show to hit the Strip is Inferno, an experience that combines pyrotechnics, dance and magic. It opened at Paris Las Vegas in January 2018. Perhaps the classiest place to see live music or theater is the Smith Center for the Performing Arts, located on the east side of the train tracks Downtown. This Art Deco-style facility, which opened in 2012, hosts everything from children’s theater to traveling performances from Broadway troupes, folk-music shows to seminars and lectures. For more intimate shows at the Smith Center, check out Myron’s Cabaret Jazz, a 240-seat venue located across from Reynolds Hall inside the Boman Pavilion. The venue serves food and drinks during most shows. There’s also not a bad seat in the house. Everybody loves a good view, and Las Vegas certainly has no shortage of vantage points from which to see the rest of the city (and the entire valley, for that matter). The most obvious option is the Stratosphere Tower, which rises nearly 1,150 feet above the Valley floor and is the tallest structure in town. The tower has a number of diversions at the top, including a rotating restaurant and bar, as well as a series of thrill rides (including a bungee jump). For a more controlled rise to the top of the town, consider a ride on the High Roller, the world’s tallest observation wheel. It takes the wheel’s pods 30 minutes to complete one rotation; parent company Caesars Entertainment even offers open bars in certain pods upon request (they call this option “Happy Half Hour”). Other views are pretty spectacular, too. 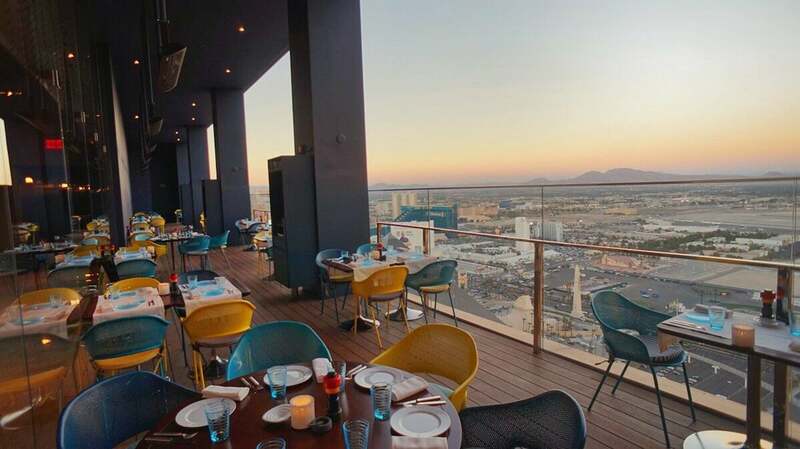 Rivea, the restaurant atop the Delano Las Vegas, has a great perspective looking north up the Strip; the Mandarin Bar, on the 23rd floor of the Mandarin Oriental Las Vegas, offers similarly breathtaking glimpses of the Strip from City Center. At the Eiffel Tower Restaurant, midway up the replica Eiffel Tower in front of Paris Las Vegas, diners have a bird’s-eye view of the Bellagio Fountains across the street. It’s one of the most romantic spots in town. Sure, Sin City has great modern restaurants, but many of the very best dining experiences in Las Vegas are those that hearken back to the olden days. Exhibit A: Hugo’s Cellar, a fine-dining steak-and-seafood restaurant beneath the gaming floor at the Four Queens Hotel & Casino downtown. Servers at this circa-1950s eatery all wear tuxedos, martinis and Manhattans come with an extra pour, and every female diner gets a red rose. The menu is old-school, too, with dishes such as Caesar salad and bananas Foster prepared tableside on roving carts. Then there’s Triple George Grill, another downtown restaurant with an old-school bar program and a menu that’s also heavy on steak. Swing by during the lunch hour and you’ll witness Vegas politicians and casino magnates getting deals done. The place has provided a backdrop for power lunches since 2005. Carbone is the youngest of the bunch — it opened inside Aria in 2015 — but the overall experience at this Italian eatery might be as throwback as they come. The dining room has dozens of leather banquettes, every table gets cold and hot antipasti, and servers dart around the room as if in a ballet. Much like Hugo’s, Carbone embraces tableside preparation. Sure, it’s over the top, but it also represents the perfect intersection of food and entertainment. It took Las Vegas decades to become a professional sports town, but with the launch of the National Hockey League’s Las Vegas Golden Knights before the 2017-2018 season, Sin City has arrived. The Knights went on to post the best point total in the NHL through the first half of the year, and tickets to home games at T-Mobile Arena have become more precious than purple chips on the gambling floor. If you can score a ticket, the experience of watching a Knights game live is electric, with fans chanting and cheering for most of every game. Another great spot to watch: the Mackenzie River Pizza Pub & Grill inside City National Arena, the team’s practice facility out in Summerlin. Sin City will welcome its second professional sports team in the summer of 2018 with the arrival of the next WNBA franchise, the Las Vegas Aces. Hoops fans are excited about the team for two reasons: First, they’ll play in a new arena attached to the Mandalay Bay Casino Resort; second, the coach is former NBA all-star Bill Laimbeer, a player known for his temper and attitude. Of course, in 2020, Las Vegas will get its third pro sports team: the National Football League’s Raiders. Though the franchise’s move from Oakland is still years away, visitors can find Raiders merchandise all over town. To say locals are excited about this development would be an understatement. Finally, nobody can mention sports in Las Vegas without giving a nod to boxing and MMA, both of which hold most of their major fights in town. Popular venues for these fights include T-Mobile Arena, the Grand Garden Arena at MGM Grand and more. On weekends when promoters have booked fights among the sport’s elite, the entire town comes to life in anticipation of the main event. 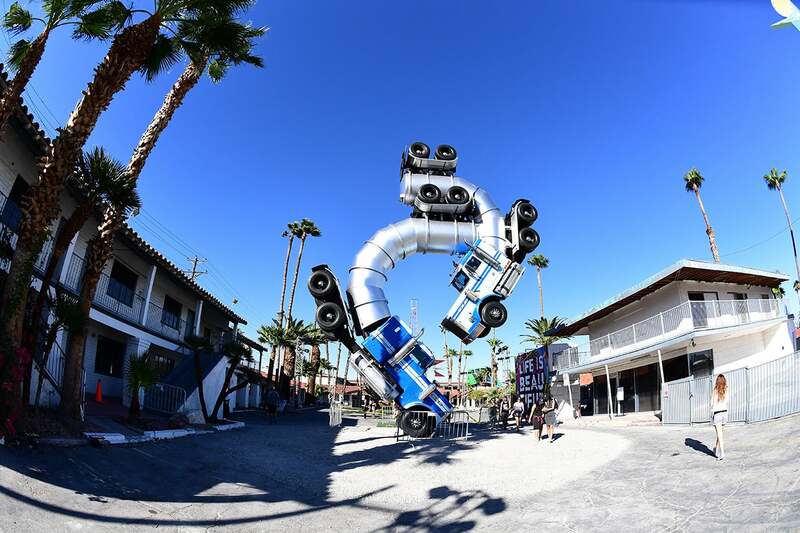 Las Vegas, art destination? Believe it. And consider this: Most of the city’s best artwork is public, which means everyone can enjoy it for free. Finally, if you don’t mind paying for your culture, check out the Bellagio Gallery of Fine Art, an old-school gallery inside the Bellagio Las Vegas. An exhibit that runs through April 2018 displays a variety of samurai armor. Past exhibits have spotlighted work from Picasso, Andy Warhol and Roy Lichtenstein. Chinatown in Las Vegas is as large and vibrant as any Chinatown in any other city in the West. The difference: In Sin City, Chinatown means a bunch of strip malls that line Spring Mountain Road, including one main complex named Chinatown Plaza. In recent months, locals have been abuzz over Chada Street, a Chinatown restaurant that specializes in dishes inspired by Thai street food. The restaurant is the first Chinatown toehold for chef Bank Atcharawan, who owns a number of other Thai restaurants around town. Judging from the hordes of people who queue up to try the duck curry and meat skewers (not to mention the spicy roasted peanuts), it won’t be Atcharawan’s last. Another Chinatown mainstay: Ronald’s Donuts. Yes, you read that right: a donut shop. Ronald’s claim to fame is there are two rows of vegan donuts, a bonus for those with dietary restrictions. In fact, PETA regularly ranks it as one of the top donut shops in the nation. The shop also makes eclairs, fritters and other sweet treats that, sadly, are not vegan, though they’re all delicious. Just make sure you bring cash. No discussion of Vegas Chinatown would be complete without at least a shout-out to the city’s most renowned Asian restaurant, Lotus of Siam (even though the restaurant technically isn’t in Chinatown). Chef Saipin Chutima has been cranking out Thai and other Asian specialties and won a James Beard Award in 2011. Fish dishes should always top your options — especially those that incorporate Chutima’s curries. The restaurant also is highly regarded for its wine list, including a special section of German rieslings that pair perfectly with spicy food.